While Verizon customers sleep happily in their beds, knowing the Droid DNA with its 1080p screen is just days away from going on sale, the rest of the world spends its nights slowly pacing the bedroom, as it waits for news of an international version to be announced. OK, this may be a slight exaggeration, but there is certainly a fair amount of anticipation surrounding a Droid DNA/J Butterfly for the rest of the world. Today, thanks to a timely leak from the @evleaks Twitter account, the phone is one step closer to becoming reality. 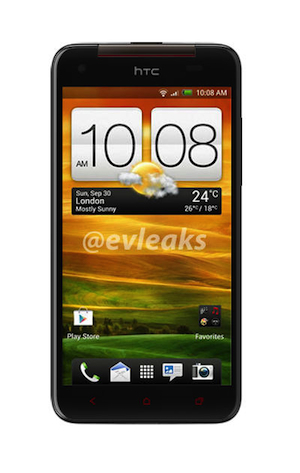 A picture showing the HTC Deluxe has appeared. Now, as it’s a face-on picture of an HTC phone, and therefore it’s relatively nondescript, it’s very difficult to match the Deluxe up with pictures of the Droid DNA to see if they’re indeed the same device. The leaked picture is referred to as a “global edition,” but of exactly what, it doesn’t say. However, given we’re waiting for news of a global edition of the Droid DNA, and that before its launch the phone was often referred to as the HTC DLX — see what they did there — it’s not a huge stretch to imagine this is the highly anticipated device. The Droid DNA has received plenty of attention since its announcement, primarily due to its 5-inch screen and 1920 x 1080 pixel resolution, but also because of concerns over the 2020mAh battery’s ability to drive that screen, and a quad-core Snapdragon processor, for more than 45 minutes without giving up. You can read our hands-on report of the Droid DNA here, and the smartphone/tablet hybrid goes on sale with Verizon on November 21. As for the international version, if it is the HTC Deluxe, all we can do is wait for HTC to announce it.